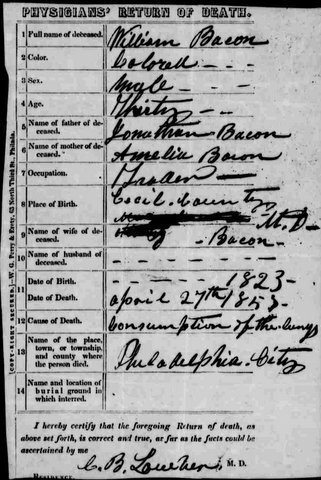 William Bacon, 30 years old, died this date, April 27th, in 1853 of Tuberculosis and was buried at Bethel Burying Ground. He lived with his spouse and children at 10 Acorn Alley and made his living at different occupation over the years, including waiter, seaman and trader. The Bacons paid $12.50 a quarter for their rent which was probably one large room or two smaller rooms. * Mr. Bacon was born in Cecil County, Maryland as it appears was his wife. Acorn Alley (now North Darien Street) ran from Spruce to Locust Streets in the 800 blocks. The week that Mr. Brown was buried, there were three other individuals interred at Bethel Burying Ground that succumbed to Tuberculosis. The red star indicates the location of Acorn Alley (now N. Darien Street). 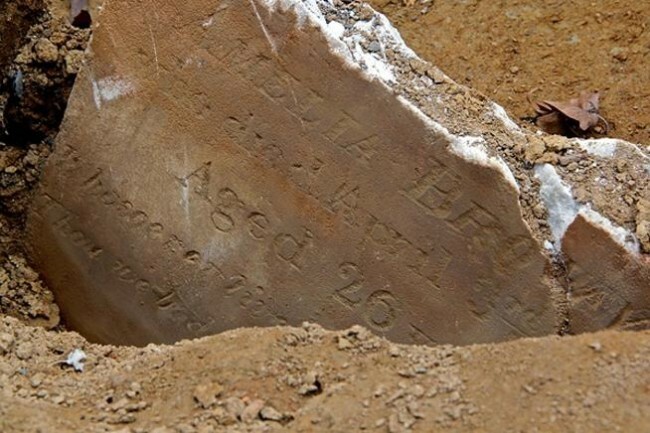 ← The Habren triplets died this date, April 22nd, in 1835 and were buried at Bethel Burying Ground.